New Jersey lawmakers have have posted A4221 in the Assembly Environment Committee for a hearing. The Chapter, along with other interested environmental groups, is advocating for the passage of this bill in 2019. By way of background, a court case struck down the 2012 NJDEP public access rules for the second time in December 2015. In January 2016, legislation was passed and signed into law to give the NJDEP the authority to require onsite or offsite public access only when issuing a permit pursuant to the Coastal Area Facility Review Act (“CAFRA”), the Waterfront Development Act and the Tidal Wetlands Act. 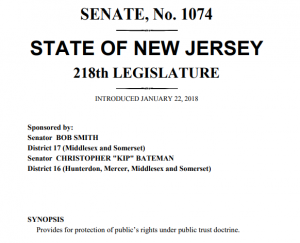 Due to the limited power of the NJDEP to regulate public access, Senator Robert Smith introduced S2490 to codify the Public Trust Doctrine and grant the NJDEP the power to enforce the Doctrine, as well as provide legislative guidance on its implementation. However, S2490 ultimately was held up in committee. The Public Access Bill was then resubmitted as S1074 and will need both the Governor’s and the NJDEP’s support. A4221 is the Assembly companion bill to S1074. On Thursday, Feb. 14, in Trenton, NJ, the Assembly Environment and Solid Waste Committee will consider A4221. Come show support for public access to our ocean, coast and tidal water shorelines and help defend public waterfront access and the public trust! We also encourage you to call the committee members below and tell them you vote “Yes” to the bill! Click here to send a message in support of the bill to your state representatives!